Stick It! 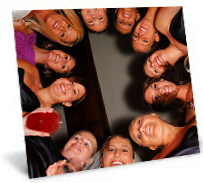 is a fun hen party game! First off, the hostess should ask everyone to sit and form a circle or line. Then, everyone is asked to put a sticker on their shirt. All of the participants will be ordered to avoid crossing their legs and refrain from mentioning the bride’s name. The goal is to get as many stickers as you can by catching those that say the bride’s name or cross their legs. The one that gets caught gives her sticker to the person that catches her. So, the one that collects the most stickers… wins! At the end of the game, the winner will be photographed with all the stickers she collected on her face. Get unique stickers and have lots of fun!